It's got a discrete GPU, but the graphics don't deliver. 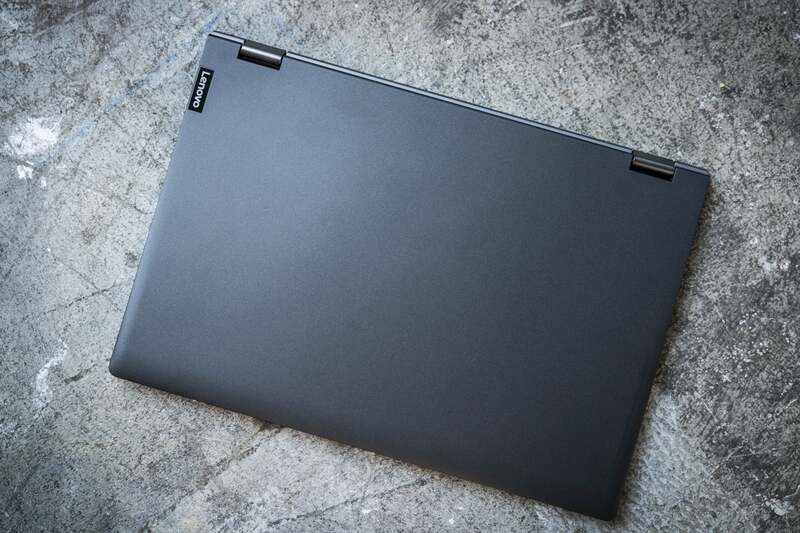 One of the cheapest thin-and-light convertibles we've tested to pack in a quad-core 8th-generation Intel CPU, the Lenovo Flex 6 14 boasts peppy productivity performance and solid battery life for a relatively budget price. Unfortunately, the Flex comes saddled with a dim screen and iffy graphics, disappointing given the system's discrete Nvidia graphics core. 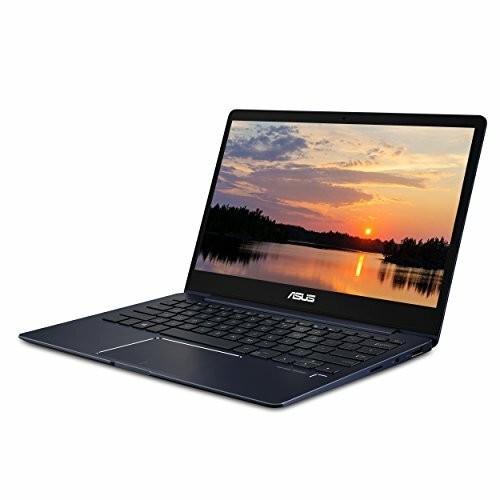 If you don't care about gaming or photo editing and you're on a budget, the Flex might be worth considering, but if you're shopping for true graphics power in an ultraportable, look elsewhere (perhaps at the Asus ZenBook 13). 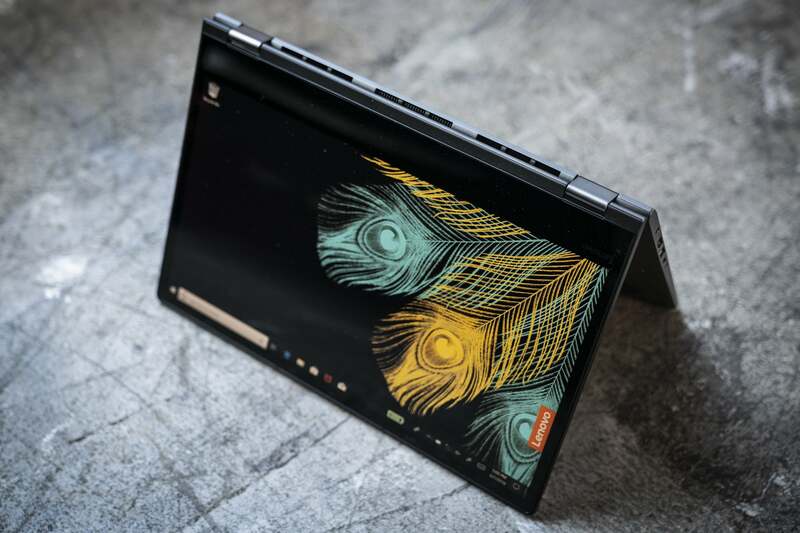 We tested the $800 configuration of the Lenovo Flex 6 14 (available on Amazon), which comes with Intel's quad-core, eighth-generation Core i5-8250U, 8GB of DDR4 RAM, a 14-inch 1920x1080 touch display, a 256GB solid-state hard drive, and discrete Nvidia GeForce MX130 graphics. The Flex's $800 price tag is pretty good on paper—and indeed, it's among the cheapest 2-in-1 systems we've tested with an 8th-generation Intel CPU. The Lenovo Flex 6 14's slim shell looks plain but professional. For example, the Asus ZenBook Flip 14, a similar 14-inch convertible with the same Core i5-8250U processor and only integrated Intel graphics has a list of $900, while you could drop more than $1,800 on Lenovo's premium, Core i5-8250U-powered ThinkPad X1 Yoga. Then again, if you want to save cash by choosing the Lenovo Flex 6 14, you'll have to put up with some compromises. Read on. Measuring 12.9 x 9 x 0.7 inches and weighing in at about 3.75 pounds (or four pounds if you include the compact, 7-ounce AC adapter), the onyx-black Flex 6 14 is slim and light enough to fall into the ultraportable category, although it's a tad heavier and thicker than some of its pricier competitors. The Flex's durable plastic shell looks plain but professional, with a just a small Lenovo logo on the edge of the gently tapered lid. A brushed aluminum palm rest sits inside. The matte surface of the Flex's lid resists fingerprints but (not unusually) tends to attract oily hand smudges. You can tent the Lenovo Flex 6 14 in a V-shape, sit it keyboard-down with its screen tilted back, or swivel its display all the way around for tablet use. Being the 2-in-1 convertible system that it is, the Flex boasts a pair of 360-degree hinges, allowing you to use the laptop in clamshell mode, tablet mode, or a V-shaped "tent" mode in between. The Flex's twin hinges felt reassuringly sturdy, holding the display in place with a minimum of wobble. The Lenovo Flex 6 14's Full-HD display looks reasonably sharp and vivid on its own, but it pales—quite literally—in comparison when you stack it up against other, brighter laptops screens. We measured the maximum brightness in the center of the screen at 224 nits (or candelas), which falls somewhat short of our 250-nit low-water mark for comfortable indoor viewing. While you can view the display relatively easily in an office setting, don't be surprised if you find yourself squinting at the screen when outdoors or near a bright window. On the plus side, viewing angles on the Lenovo Flex 6 14's IPS-technology display were quite good. The screen dimmed only slightly when viewed from extreme angles and showed no signs of inverse colors, as you'll often see on cheaper displays. The Flex's touch display responded smoothly to my taps and swipes, and it also boasts pen support. You can snag Lenovo's Active Pen, complete with 2,048 levels of pressure sensitivity and a plastic USB pen holder, for $40. 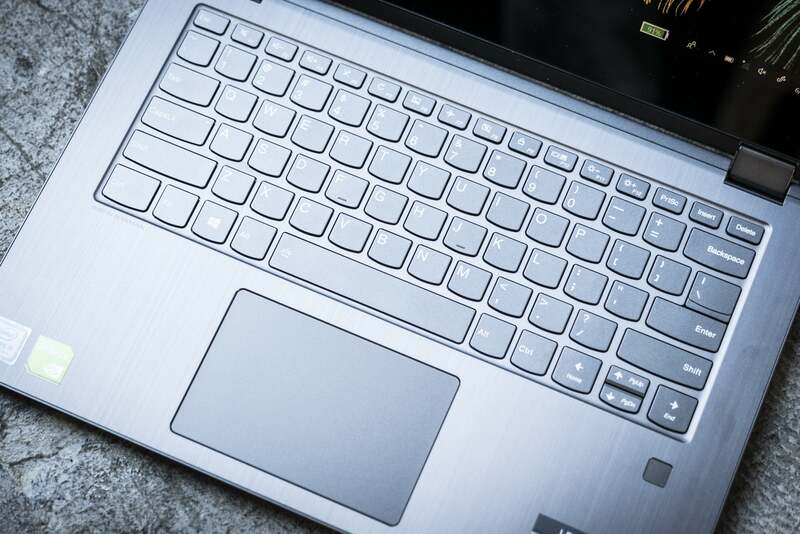 The Lenovo Flex 6 14's backlit keyboard feels adequate, with slightly concave keys that sport a tactile bump about halfway through each keystroke. Wisely eschewing a 10-key numeric keypad, the Flex’s keyboard feels reasonably roomy, with easy discovery and (unless you press hard) little sign of bending in the middle. The Lenovo 6 14's backlit keyboard feels roomy, with keys that boast a tactile bump halfway through each keystroke. The Flex's midsize trackpad felt smooth and responsive to my fingertips, and it never registered any false swipes during my testing, although it does require a fair amount of pressure to click. Just beneath the bottom-right corner of the keyboard sits the Flex's fingerprint reader, which lets you unlock your Windows profile and open Windows Hello-compliant apps with a single touch. I used the fingerprint reader throughout my testing and rarely had any problems. The Lenovo Flex 6 14’s bottom-firing Harman Kardon speakers are a tiny cut above your average laptop speakers, but they’re still pretty (and unsurprisingly) iffy. While I enjoyed the wide separation between the left and right stereo channels, details were a bit muddy, bass was virtually non-existent, and the sound wasn’t that loud even after cranking the volume all the way up. That’s all pretty typical as far as laptop speakers go, but don’t get your hopes up because of the Harman Kardon brand name. Meanwhile, the Flex 6 14’s 720p webcam (which sits in the top bezel of the screen) is fairly decent—a little grainy and noisy, as usual, but still it still manages to capture relatively clear and sharp video, handy for Skype chatting. The Lenovo Flex 6 14’s collection of ports is solid, but nothing special. On the left side, you get barrel-shaped charging port, a full HDMI video port, the first of two USB 3.0 Type A ports, a single USB 3.0 Type C port, and a combo audio jack. 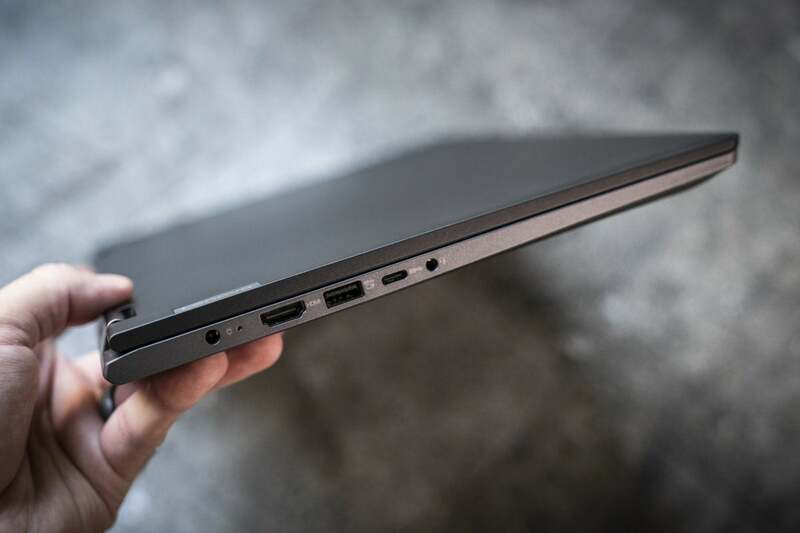 The Lenovo Flex 6 14's left-side ports include a full HDMI port, a USB 3.0 Type A port, a USB 3.0 Type C port, and a combo audio jack. On the right sits a Kensington lock slot, a second USB 3.0 Type A port, an SD card reader, and the power button. Right-side ports on the Lenovo Flex 6 14 include USB 3.0 Type A and an SD card reader, but no Thunderbolt 3. Overall, that’s a perfectly respectable collection of ports, although we’re bummed by the lack of Thunderbolt 3 ports, likely a concession to the Flex’s budget price tag. After putting it through a series of benchmarking tests, we're confident in saying that the Lenovo Flex 6 14 is a smooth, relatively speedy performer when it comes to general productivity tasks, particularly given its budget price and svelte chassis. But as you'll see in a moment, the Flex 6 14's graphics performance comes up disappointingly short, a shame given the system's discrete graphics core. 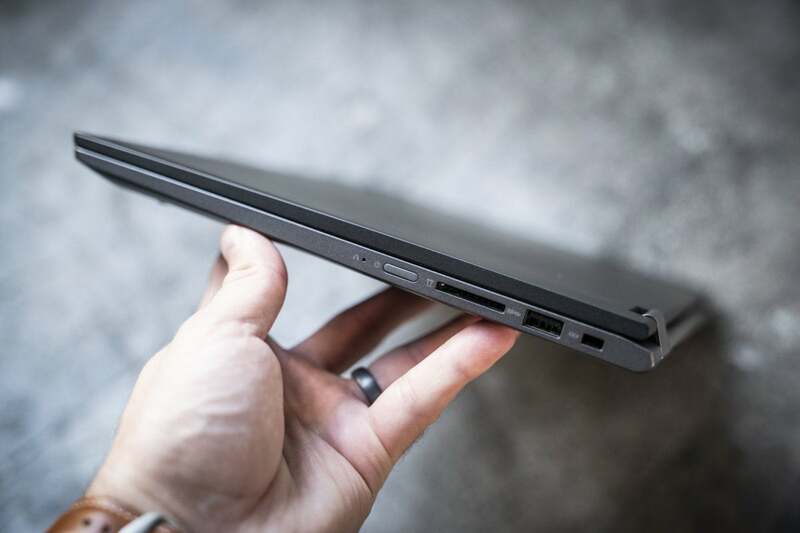 First, we fired up PCMark 8 to see how the Lenovo Flex 6 14 performs when it came to day-to-day computing duties such as web browsing, composing Word documents, tinkering with spreadsheets, and the like. 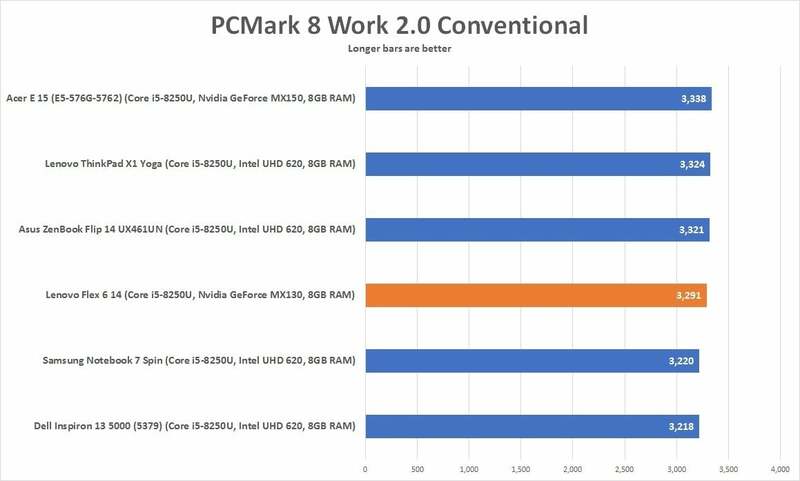 PC Mark Work 8 Conventional should be a breeze for a quad-core Core i5-8250U such as the Lenovo Flex 6 14 sports, and it is, making it well-qualified for mainstream productivity applications. 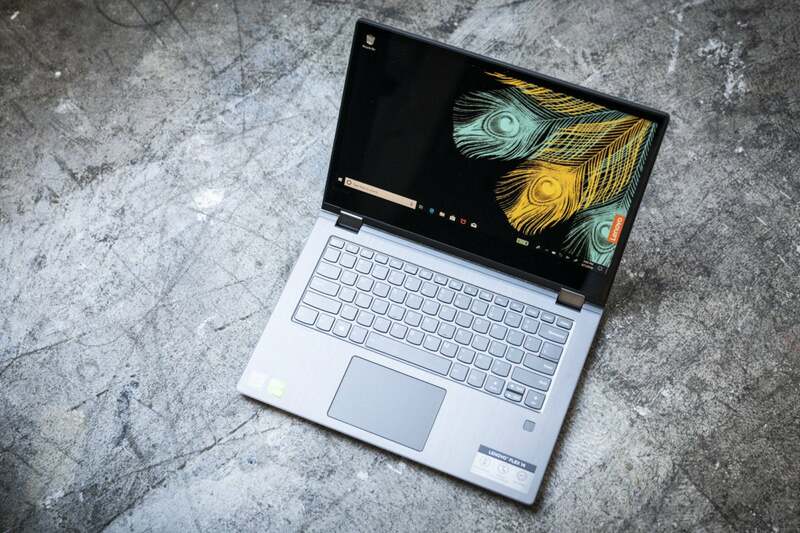 Unsurprisingly, the Flex 6 14 passed our PCMark 8 test with room to spare, easily besting the 2,000 mark that we deem the minimum for smooth Office performance, as well as notching a result that's in line with competing 2-in-1 ultraportables. While PCMark 8 is a benchmark at which even cheaper dual-core laptops can excel, our next test is another story. By using the free HandBrake utility to convert a 30GB MKV video file into an MP4 file, we can get a pretty good idea of how a given laptop beats the head under a prolonged and crushing CPU load. The Lenovo Flex 6 14 probably took a little longer to finish the HandBrake encode because of thermal throttling as the CPU heated up. With its Handbrake score of nearly 4,400 seconds (or about an hour and 13 minutes), the Lenovo Flex 6 14 lands right in the mix with other 8th-generation 2-in-1 laptops we've tested. The Flex 6 14 throttled its CPU clock speed to about 2.3 GHz (down from its typical cruising speed of 3.38 GHz) during most of the test. Such a concession to the heat is typical for recent convertible systems we've tried. Laptops with traditional, easier-to-cool clamshell form factors (like the Dell XPS 13) can often get away with speedier HandBrake performance. 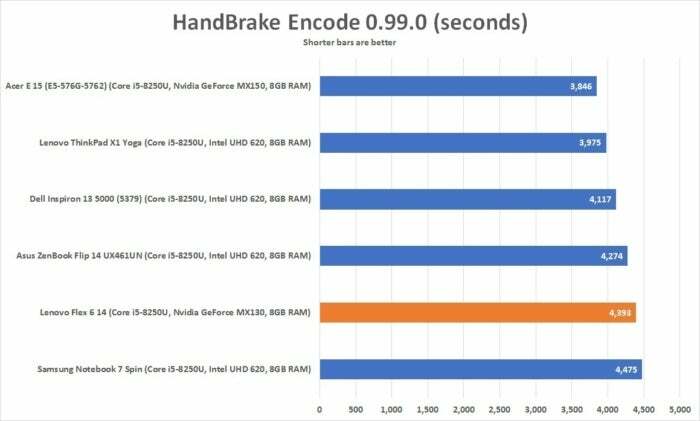 While Handbrake puts a heavy strain on a CPU for about an hour or more, our processor-intensive Cinebench test (which involves rendering a 3D image in real time) lasts mere minutes, giving us a better understanding of how a laptop handles short bursts of stress. 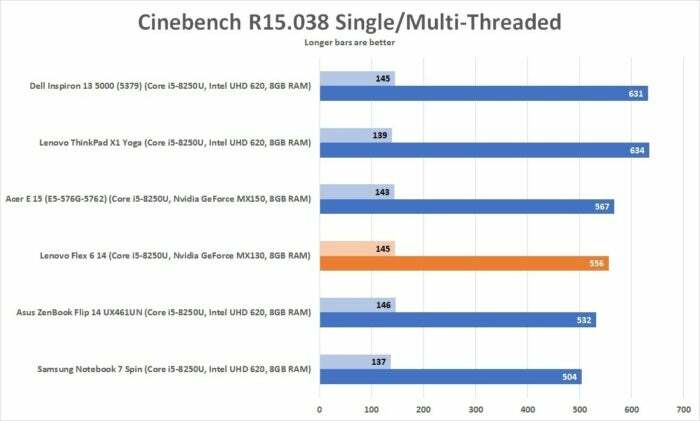 The Cinebench CPU test showed that the Lenovo Flex 6 14 can hold its own in single-threaded applications. In multi-threaded applications (the longer bar), it once again restrained itself for the sake of thermals, but not by much. With 4 cores and 8 threads in its CPU, plus Hyper Threading, which allocates CPU resources dynamically, the Lenovo Flex 6 14 brings plenty of resources for mainstream tasks. 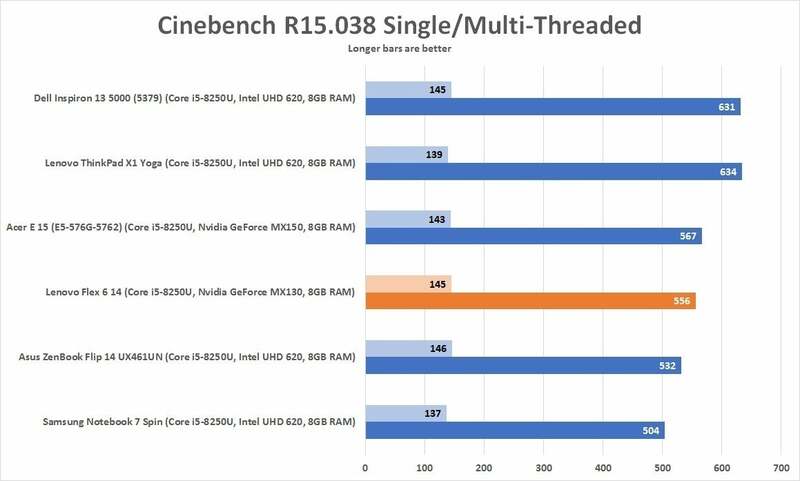 In both single-threaded and multi-threaded Cinebench testing, it turns in a performance consistent with other sub-$1000 8th-generation 2-in-1 systems, though it dials down its CPU clock speed to about 2.4GHz to control temperatures. An $800 ultraportable with a discrete graphics core: That’s the promise of the Lenovo Flex 6 14, and on paper, the prospect sounds enticing. In practice, however, we were fairly underwhelmed by the Flex’s graphics performance. 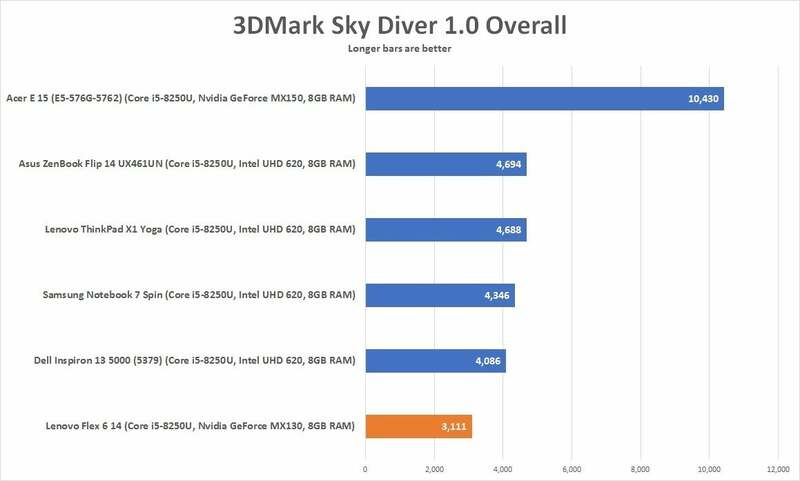 Armed with the Nvidia Geforce MX130, which sits in the middle of Nvidia’s entry-level mobile MX line, the Flex only managed an average overall Sky Diver score of about 3,100, well below the results of competing 8th-gen 2-in-1s with integrated Intel UHD 620 graphics. With its discrete GeForce MX130 GPU, we expected more from the Lenovo Flex 6 14 in gaming benchmarks. The convertible appears to be holding back to control thermals. We ran the Sky Diver benchmark multiple times just to be sure. Even the Flex 6 14’s very best scores (about 4,020, only twice out of 10 tries) still came in somewhat below what we saw in competing convertibles with integrated graphics, and way behind a recent laptop (the Asus ZenBook 13) with MX150 graphics. The Flex 6 14’s disappointing Sky Diver performance could simply be a thermals issue, and indeed, we noticed the system briefly slamming the brakes (via power-limit throttling) on the CPU about a minute or so into the test as internal temperatures began to mount. While discrete mobile graphics cards like the MX130 are intended more for boosting photo and video editing rather than playing games, we went ahead and fired up a few gaming favorites. The Tomb Raider reboot from 2013, for example, only gave us a woeful 4.4 frames per second with the graphics settings maxed out, or just 22.8 fps on the lowest graphics settings. Meanwhile, we had to dial down Fortnite all the way to the lowest settings (including painfully blocky visuals) just to maintain a steady 30 fps. We measure battery life by looping a 4K video using the stock Windows Movies & TV app, with screen brightness set as close to 250 nits as possible (only 224 nits, alas, on the Flex 6 14's dim display). We also set volume at the 50-percent mark, with headphones plugged in. 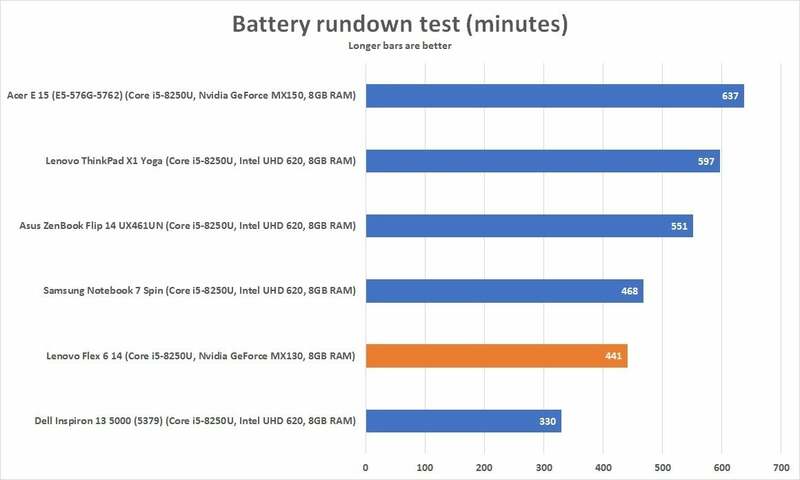 The Lenovo Flex 6 14's 7.5 hours of battery life brings up the rear compared to similar competition, though to be fair, some do have larger batteries. 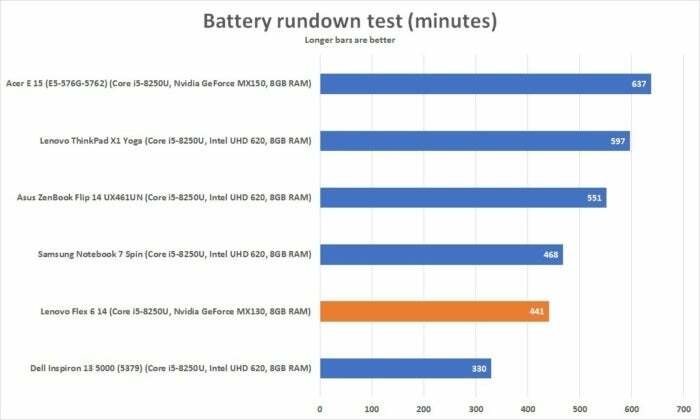 The Lenovo Flex 6 14's average battery drain result of 441 minutes (roughly 7.5 hours) isn't bad considering its 45 watt-hour battery, and it's comparable to another 8th-generation convertible with a similar-sized battery, the Samsung Notebook 7 Spin. Other systems in our comparison chart boast more battery capacity. The Lenovo Flex 6 14 boasts peppy productivity performance, a discrete GPU and solid battery life for a relatively budget price, but it also comes saddled with a dim screen and iffy graphics.